Costa-Gavras’ superlative political thriller begins with a skeptical attitude, but soon pulls viewers into the depth and breadth of a monstrous political crime aided and abetted by our own U.S. government. Sissy Spacek and Jack Lemmon headline a strong cast, in a story that our State Department called a pack of lies — until the truth became undeniable. Starring: Jack Lemmon, Sissy Spacek, Melanie Mayron, John Shea, Charles Cioffi, David Clennon, Richard Venture, Jerry Hardin, Richard Bradford, Joe Regalbuto. Constantine Costa-Gavras made a big international impact eleven years earlier with ‘Z’, a compelling story about political assassination and dictatorship in Greece. He and co-screenwriter Donald Stewart won an Oscar for Best Adapted Acreenplay for this Universal production, a politically aware film clearly aimed to provoke a reexamination of America’s relationship with Latin America. It is filmed primarily in English and stars the popular Jack Lemmon and Sissy Spacek. The story begins from a politically neutral position. Charlie and Beth Horman (John Shea and Sissy Spacek) are among dozens of young Americans stranded in Santiago when the coup breaks out. Denied aid by the U.S. Embassy, they find it impossible to move about in the city. Roving army squads are shooting people in the street; thousands are being arrested. Trapped after curfew, Beth spends the night cowering in an alcove. She returns home to discover that Charlie has been taken by a military squad. Embassy officials offer no help, insinuate that Charles is a dangerous troublemaker and ask Beth to turn over the names of her husband’s friends. Charles’ father Ed (Jack Lemmon), a New York businessman, flies to Chile to get action on his son’s release from custody. Ed openly blames Beth for her and Charlie’s lifestyle but changes his mind when obstructed by the Ambassador and his patronizing assistants. The embassy’s version of events conflicts with the facts, and the Ambassador becomes irate when Ed disputes the official claim that the U.S. has nothing to do with the coup. Beth and Ed continue their search in the hazardous city. There’s nothing overtly propagandistic about Costa-Gavras’ approach. He invents no scenes and shows only those events personally witnessed by Charlie’s wife and father, their friend Terry Simon (Melanie Mayron) and Charlie’s writer friend David Holloway (Keith Szarabajka of 2008’s The Dark Knight). Ed Horman initially assumes that Charlie ‘must have done something’ to be arrested. Flashbacks show that Charlie is a free spirit who translated New York Times articles into Spanish for a Chilean paper, and wrote children’s books in his spare time. Stuck in Viña del Mar as the coup begins, Charlie and Terry become afternoon guests of American military men and shadowy plainclothes operatives. His offense is sympathizing with the Allende administration, and learning too much about covert American activities. David Holloway and his friend Frank Teruggi (Joe Regalbuto) are arrested and taken to a giant sports arena. Thousands of detainees are held in the stands while an unknown number are summarily executed by death squads in the tunnels below. Costa-Gavras shows no tortures or executions or other speculative scenes, instead taking us into hospital morgues and basements overflowing with murder victims. In one scene Charlie awakens in a seafront hotel, to find a Chilean army helicopter hovering outside and pointing a machine gun at his window. Lifelong Republican Ed Horman receives a crash course in a reality that he previously dismissed as leftist paranoia. It’s obvious that the embassy officials are lying to him. One even has the temerity to lecture Ed that his complacent worldview wouldn’t have been challenged if he’d just stayed home and minded his own business. To blame Charlie for his own disappearance, the official asks Ed to compare his son to a foreigner who came to America and ran afoul of the Mafia. Would Ed blame the police? Missing is a superb movie that plays to all segments of the political spectrum. Costa-Gavras makes no speeches and respects the intelligence of his audience. The story unfolds as a dreadful mystery that pays off with disillusion or enlightenment, depending on one’s point of view. The director is not above the occasional artful shot, as when Beth watches an army jeep chase a symbolic white horse through the streets of the city. But the political terror is all too real — on the streets of Santiago, the authorities are indiscriminately gunning people down. In far too many countries, such conditions are the everyday reality, the norm. Melanie Mayron (Girlfriends) is sweet-tempered as Terry Simon and John Shea is endearing as Charlie Horman. Various state department and military intelligence men are played by Charles Cioffi, David Clennon (The Thing), Richard Venture and Richard Bradford (The Chase). Favorite Janice Rule, also from The Chase, is a journalist experienced in reporting from unstable Latin American countries. Both Sissy Spacek and Jack Lemmon were nominated for best acting Oscars. Despite all that happens, the audience is left with a positive ending, in the bond of understanding that forms between Ed and his daughter-in-law Beth. The military coup in Chile is one of the low points of postwar politics in the Western Hemisphere. Recommended strongly are two films on the subject, Patricio Guzman’s phenomenal epic documentary The Battle of Chile, and Pablo Larraín’s entertaining drama about healing the Pinochet rift in the late in the 1980’s, ‘No‘. Powerhouse Indicator’s Region B Blu-ray of Missing is yet another UK disc that follows up on a domestic Criterion release (DVD, 2008), offering different extras. The HD transfer presumably sourced from Universal is extremely attractive. Note that the Region coding has been enforced on this Region B release — it won’t play on domestic Region A players. Criterion’s extras had concentrated on the political aspect of the movie; Powerhouse Indicator’s don’t shy away from such material but lean more toward production stories and personnel. Director Keith Gordon contributes his own take on making a film about political adventurism in Latin America. Lengthy post-screening audio interviews provide full career discussions from the director and actor Jack Lemmon. Lemmon’s talk covers his full history, but when he gets to Missing he singles out Costa-Gavras for special praise. As Pinochet’s regime was still in power in 1981, Costa-Gavras filmed Missing in Mexico. In audio and video interviews he reveals that the Hollywood producers had no trouble securing artistic freedom for the European director. He was able to shoot where he wanted, with his own French crew, and with his desired cast. The only foot-dragging was over the hiring of Jack Lemmon, whom Universal felt was mainly associated with comedies. Costa-Gavras likes to talk about the marvelous cooperation he received on his Mexican location. When Mexican tanks became unavailable, studio craftsmen constructed convincing wooden mockups overnight, large props that had to be moved by man-power. Charles Horman’s widow Joyce appears in a video as well. 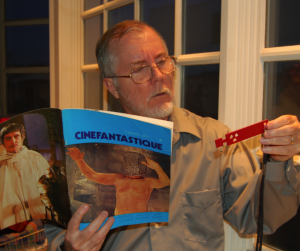 An illustrated booklet contains a long essay, an interview with the author of the source book Thomas Hauser, critical responses and newspaper reprints that document arguments for and against the film’s political accuracy. Missing may criticize the American record in Chile, but it’s not anti-American. Costa-Gavras asserts more than once that the United States has more freedom of speech than any other country he knows, including France. He emphasizes that the existence of Missing is in itself a pro-American statement. Supplements: (from PH:)Audio commentary with actor John Shea and critic Jim Hemphill; The Guardian Interview with Jack Lemmon and Jonathan Miller (1986): audio recording from London’s National Film Theatre; Keith Gordon on Missing (2018): a new filmed appreciation by the filmmaker and actor; Archival interviews with director Costa-Gavras, trailer, image gallery; Illustrated 40-page booklet with a new essay by Michael Pattison, an overview of contemporary critical responses and historic articles on the film.